Henry Kissinger is an American political scientist notably known for his work on the United States foreign policy. He served as the Secretary of the State and before that, National Security Advisor under the administration of President Richard Nixon and subsequently, President Gerald Ford. He was responsible for introducing Realpolitik, a type of diplomacy based on practicality, to US politics. With this, he played an important role in negotiations with China, in the Soviet Union, and in Vietnam, to name a few. He was awarded the Nobel Peace Prize in 1973 alongside Vietnamese, Le Duc Tho for their work on negotiations leading to ceasefires during the Vietnam War. Tho, however, declined and Kissinger accepted amidst protests and controversies, including the resignation of two committee members. President Gerald Ford and Secretary of State Henry Kissinger, conversing, on the grounds of the White House, Washington, D.C..
Henry Kissinger at the 2009 premiere of the Metropolitan Opera in New York City. Photographer's blog post about event and photograph. 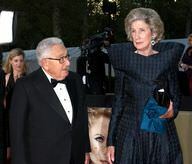 Henry Kissinger is a famous American politician, who was born on May 27, 1923. As a person born on this date, Henry Kissinger is listed in our database as the 2nd most popular celebrity for the day (May 27) and the 4th most popular for the year (1923). People born on May 27 fall under the Zodiac sign of Gemini, the Twins. Henry Kissinger is the 101st most popular Gemini. Aside from information specific to Henry Kissinger's birthday, Henry Kissinger is the 774th most famous American. In general, Henry Kissinger ranks as the 1328th most popular famous person, and the 18th most popular politician of all time. “The Famous Birthdays” catalogs over 25,000 famous people, everyone from actors to singers to scientists to serial killers and more. If you're curious to see who was born on your birthday, you can use our database to find out who, what, where, when and why. You can search by birthday, birthplace, claim to fame or any other information by typing in the search box, or simply browse our site by selecting the month, the day, the horoscope, or any other clickable option.